On a total whim I took a pregnancy test yesterday afternoon - the day my period was due. It was very faintly positive. I retested this morning and it looks the same - just barely positive and not any darker. 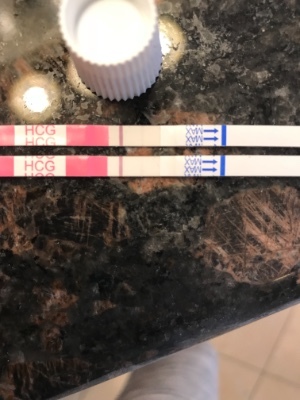 Is this a chemical pregnancy more than likely? It takes 48hrs for HCG to double in early pregnancy, so it's not a surprise that it would be much darker from afternoon to the next morning. So it's really considered normal IMO. And I also want to add that it could have implanted late and that is why it is faint.